Mineral Wool - Amity Insulation Group Inc.
As part of its insulation line, Amity is proud to be working with the Rockwool / Roxul group in supplying their Enertek 1200 Mineral Wool Pipe Covering which is well suited to thermal insulation projects, and sound reduction/absorption and is available in one piece sections, and convenient lengths. Slit along the longitudinal axis for ease of application, Enertek’s sections readily snap into position over piping. Enertek 1200 is especially well suited to hot and cold piping, as it conserves energy, maintains process temperatures, provides personnel protection, prevents condensation, and reduces noise emission. Amity is also proud to supply half-cylinder V-Groove pipe insulation, manufactured from mineral wool bonded together with a quality high temperature binder and fiber orientation parallel to the heat source. 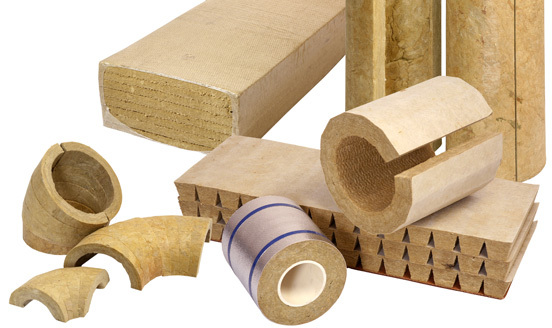 V-Groove mineral wool is produced to fit precise pipe and tubing applications for commercial and industrial uses. This pipe insulation is shipped flat, saving on freight, and is easy to install (field formed) especially on larger pipelines. Accessories needed to complete your mechanical insulation system requirements are readily available through Amity’s distribution and fabrication facilities in Alberta’s capital region. Top quality metal supply is sourced for metal products supplied by Amity and its insulation distribution and fabrication facilities in Edmonton, Alberta. Our metal products can be relied upon for effective use in pipe, tank, and vessel applications requiring reliable protection. © Copyright Amity Insulation Group Inc.